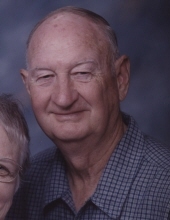 He was born May 29, 1933, in Huntingburg, Indiana, to Wendell Oliver and Iola Edna (Skaggs) Ferguson; and married Barbara Ann Barnett on June 29, 1957, at the Dale United Brethren Church. Grant worked as a truck driver; was a member of V.F.W. Post #2366 and the Huntingburg Fraternal Order of Eagles; and loved spending time with his grandchildren and great-grandchildren. He served in the United States Army from 1954-1956, stationed in Germany with the 67th Armored Tank Battalion. Grant was preceded in death by his parents; and one brother, Walter Ferguson. He is survived by his wife, Barbara Ann Ferguson of Huntingburg; three children, Darla Ferguson of Huntingburg, David (Brenda) Ferguson of Dubois and Daryl (Judy) Ferguson of Huntingburg; two brothers, Irvin Ferguson of Greensburg and Jerry Ferguson of Florence, Kentucky; by (11) grandchildren and (13) great-grandchildren. Funeral services for Grant Ferguson will be held at 10:00 a.m., E.S.T., on Thursday, March 28, 2019, at the Nass & Son Funeral Home in Huntingburg with burial to follow at Fairmount Cemetery in Huntingburg. The V.F.W. Post #2366 Memorial Detail will conduct military graveside rites. Military graveside rites will be conducted by the V.F.W. Post #2366 Memorial Detail. "Email Address" would like to share the life celebration of Grant Eugene Ferguson. Click on the "link" to go to share a favorite memory or leave a condolence message for the family.